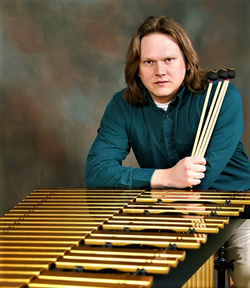 NACOGDOCHES, Texas - The Stephen F. Austin State University School of Music will present guest artist Shane Reeves in a percussion recital at 6 p.m. Monday, March 11, in Cole Concert Hall on the SFA campus. Reeves is on the music faculty at Francis Marion University in Florence, South Carolina, and is the principal percussionist for the Florence Symphony Orchestra, principal timpanist for the Masterworks Choir, and drummer for the experimental rock group Yellodrama. He will perform works by Claude Debussy, Mark Applebaum, Pyotr Ilych Tchaikovsky, Robert Stright, Dave Hollinden and Andy Akhio. He will also perform one of his own compositions, "Scavenger Mastermind." The piece is a multi-percussion solo that makes use of a variety of instruments including gongs, woodblocks, drums and castanets, along with non-conventional instruments such as a metal bowl and a wooden plank. "I wanted to create a piece that treated the setup as a single instrument rather than a conglomeration of instruments," Reeves writes of the music. "The piece is performed with four mallets throughout and is written as if the entire setup was some type of exotic marimba. This idea came out of my interest in mimicking electronic sounds with acoustic instruments." Other works on the program are Debussy's "La fille aux cheveux de lin" from Préludes Book I, Applebaum's Entre Funérailles II, Tchaikovsky's "October" from "The Seasons," Op. 37a, Stright's "Six Poems," Hollinden's "Of Wind and Water" and Akiho's "Macqueripe." A native of Birmingham, Alabama, Reeves has performed at many conferences and conventions and with a variety of musical ensembles such as the Central Florida Symphony, Fayetteville Symphony, Gainesville Chamber Orchestra, Palmetto Opera, South Carolina Philharmonic, Wilmington Symphony, J'Ouvert Steel Band, Pantasia Steel Band, Sunshine Steelers, Jacare Brazil and the Woyate West African Drum and Dance Ensemble. As a member of the Florence Symphony Orchestra, Reeves has shared the stage with Art Garfunkel, The Indigo Girls, Point of Grace and Cirque Musica. Recital tickets are $8 for adults, $6 for seniors and $3 for students and youth. For tickets or more information, call the SFA Fine Arts Box Office at (936) 468-6407 or visit www.finearts.sfasu.edu.